Canoeing on the Bow River or Lake Louise is the quintessential Canadian activity; a peaceful paddle offers some of the most beautiful scenery in the park and excellent opportunities for viewing wildlife. In the Town of Banff, paddlers of any level may rent canoes at the canoe docks at the north end of Bow Avenue. From the canoe docks, paddlers who put in directly may choose to explore a gentle leg of the Bow River or have the option to follow Forty Mile Creek into the Vermilion Lakes. You can also bring your own canoe and launch it from the docks. The canoe docks are municipal recreation facility and are open to the public. More information about paddling those sections of the river is available from Parks Canada. Canoes are also available to rent at Moraine Lake and Lake Louise. Hourly rentals allow visitors to paddle up and down these lakes, enjoying majestic views from a unique vantage. 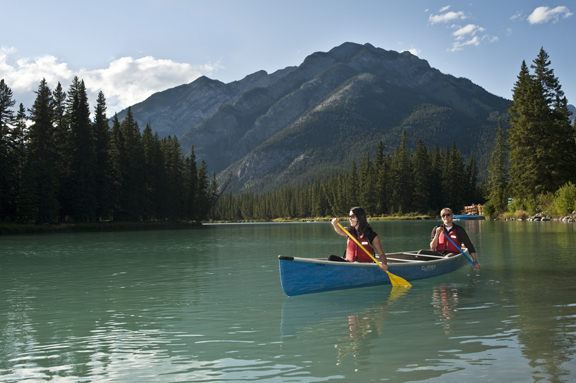 Information on canoe rentals is available from Banff Lake Louise Tourism.